A beachcombing business owner loves glass shards. (FSB Magazine) -- It's Sunday morning, and Louise Rogers is in her usual weekend pose: eyes downcast, strolling meditatively along the beach. She paws at a ribbon of gravel near the low-tide mark and picks up a milky aqua-colored lump the size of a matchbook. She brushes off the sand and issues her verdict: "Coca-Cola bottle. Before 1970." 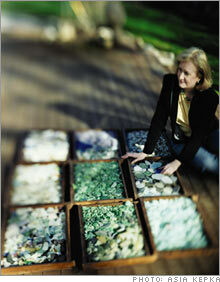 Rogers, 53, has been collecting sea glass since the age of 6. She logs several miles each Sunday beachcombing New England's coastline with her husband and business partner, Ben. They founded Rogers Gallery, a custom framing and fine art store in Mattapoisett, Mass., in 1978. Seven years ago they added Surroundings, an adjacent home-furnishings and interior-design center. The two (surroundings-rogersgallery.com) generated a combined $3 million in sales last year. When Rogers spies a new shard on a beach, she guesses its age and origin by looking at surface wear and crack patterns. She often finds glass on beaches where town dumps existed centuries ago. Also fruitful are locations hit by violent storms, such as coastal areas flattened by the hurricane of 1938, which leveled Rogers's grandmother's Mattapoisett house. Any Depression glass or patterned china she finds in these areas were probably blown into the sea by that legendary storm. Rogers picks up her oldest specimens, two intact bottlenecks made of black glass. One, a bottle collector has told her, is from a snout-nosed gin bottle dating to the late 1700s. "People walk past black glass. They think it's just a rock, but it's extremely rare," she says. Next, she rotates a cat's-eye marble between her fingertips. It's from the 1950s, judging by its surface, which is lopsided and etched from exposure to sand and saltwater. Uncommon colors such as orange and red are her Holy Grail. She also favors glass embossed with identifiable patterns or labels, such as the word "Hood" from the Charlestown, Mass., dairy's milk bottles. All sea glass is becoming less common as more glass is recycled and plastic bottles become the norm. While sea glass is widely available for purchase - a turquoise piece fetched more than $250 on eBay (Charts, Fortune 500) - Rogers prefers finding her own. Vacations to shoreline destinations feed her collection. Last year she traveled to Peaks Island in Maine's Casco Bay, where she found a china doll's arm. "My first body part!" she says. She may have countless pounds of glass, but it's clear Rogers enjoys most the thrill of the hunt. "I love beach-combing for the same reason that I love finding new items for the stores," she says. "I love the surprise." Do you supplement your small business with a hobby? Do you earn income from your hobby? Tell us about your enthusiasms on the FSB blog.